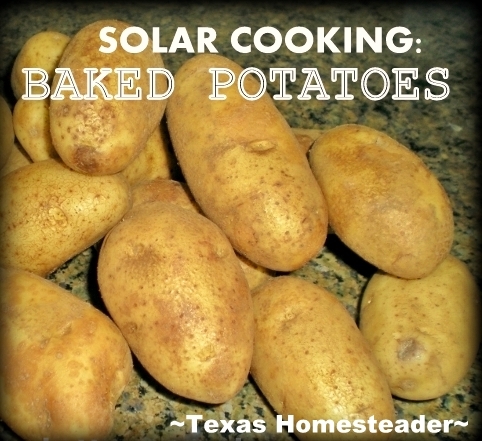 Solar Cooking: Baking Potatoes Using Just The Sun! 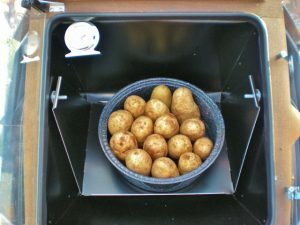 I came across a great deal on potatoes recently and thought I’d use my solar oven to cook up some delicious baked potatoes. In this case I was ultimately going to dehydrate most of the potatoes for future consumption but I read that you have to cook them before you can dehydrate them so I figured I’d kill two birds with one stone today. Well folks it’s still hot enough in Texas in early October that it’s not exactly the best time to throw on your heat-producing oven and bake potatoes. Enter my handy-dandy solar oven – MAN I love this thing! (for those of you asking, I have a Sun Oven * solar oven. I got the accessory kit so my solar oven’s been going almost every day for the past two weeks either cooking or dehydrating garden produce. Aaaaaanyway, here’s how I did it. First I washed and dried enough potatoes to fit snugly into a black enamel covered pan. Then I used the sharp point of a knife to pierce each potato several times and stacked them into the pan. They all fit in quite nicely. Now here’s the really hard part. I put the pan into the solar oven, covered the pan, closed & latched the lid, pointed the reflectors at the sun and cooked them for about 3 hours. How’s that for easy!?? The temps inside the oven stayed about 300 – 350 for most of that time. I adjusted the reflectors about every hour to keep track of the sun, but a rule of thumb if you’re not going to be around to babysit the oven is to point the reflectors at the sun when you start your timing, and additionally rotate it about 30-degrees clockwise. This gives you approximately 4 hours of average sun before you’ll need to realign the reflectors to keep the heat going. Although you sacrifice some of the consistent heat inside the oven by using this averaging method, it’s often offset by the convenience of set it & forget it for 4 hours. You just need to add a little more cooking time to compensate for the lower temps. EASY! Anyway the potatoes were done to my liking after about 3 hours. It doesn’t get much easier than that! Of course we enjoyed baked potatoes with our supper that night but most of these potatoes went into the refrigerator to cool overnight to prepare them for dehydrating the next day. I love to make them into dehydrated Hash Browns! * A word about our Affiliate Link – We are currently enrolled as an Amazon Affiliate. Occasionally I will insert an affiliate link into one of my posts if I think it may be of interest to you. I receive nothing from the manufacturer, but I love this solar oven & thought you might too. If you click on any of my affiliate links and buy something (almost anything, not just what was linked) I get a small referral percentage from Amazon. But here’s the really important part – the price you pay for your items is UNCHANGED. This entry was posted in Blog Posts and tagged Cooking, Environment, Frugality, Solar Cooking on October 11, 2013 by Texas Homesteader. This is fascinating! I really should look into getting one of those ovens. How warm does it need to be outside for it to work? I’m loving this! I’m in an area with 90+ degree summers and am looking into solar cooking to avoid heating up the kitchen. Thanks for sharing your experience. My daughter has been studying solar power. I was really interested in how you did this! I love my solar oven for potatoes!! We shared with our FB readers at homesteadlady.com.